Check out the “Swan Cam” at Swan Park. The swan cam gives people all over the world the opportunity to go online and view the swans straight from their computers. Thank you to the following businesses for helping make the swan camera possible; Xcel Energy, FiberNet Monticello, Wright Hennepin Electric, Wes Olson Electric, Monticello Parks Department, and Doug’s Computer Service. Click here to view the Swans! The Swan City Heritage Foundation has received their 501c3 status, which means your donations are now tax deductible. Please make checks payable to the Swan City Heritage Foundation, you can drop them off at the Chamber office or directly to Premier Bank or RiverWood Bank. Thank you for your continued support of Sheila's legacy. Thursday, January 3, 2019: Swan Park was closed for the day to safely remove some fallen trees from the feeding area. Since the surrounding fields are not covered in snow, the birds are in the area feeding on their own. Please watch for further updates on when daily feeding will begin. Friday, November 30, 2018: The Trumpeter Swans have started returning to the area. They have been seen in nearby fields and lakes that have open water. They prefer to be in the fields feeding and are doing so since we have little snow cover. 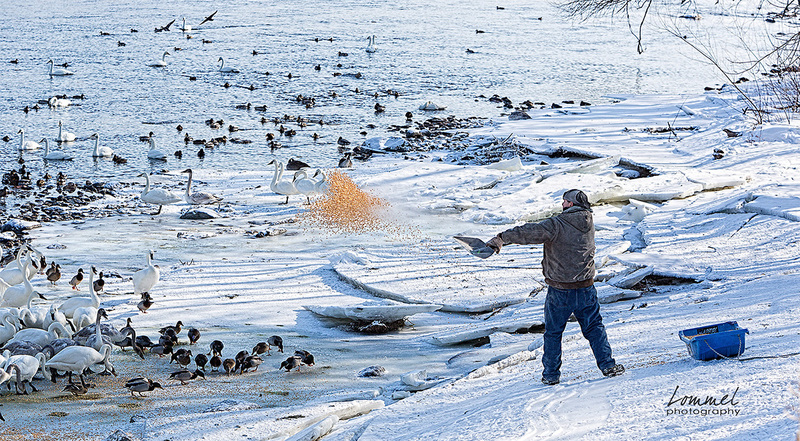 As the temperature drops and freezes up the lakes and ponds and the fields are covered in snow, they will head to the Mississippi River to feed. Friday, November 23, 2018: Jim Lawrence has been in close contact with the parks department regarding two downed trees in Swan Park. The parks department was aware of them back in June, but couldn't remove them due to a high water situation. They have since been able to remove one of the downed trees. This was the one that was laying in front of where the auger comes down to the shoreline. Feeding time is every day at 10:30 am. If you stop into the park during feeding time Jim Lawrence is there to help educate you on these beautiful birds. In April 2011, Shiela Lawrence known as “The Swan Lady,” passed away. 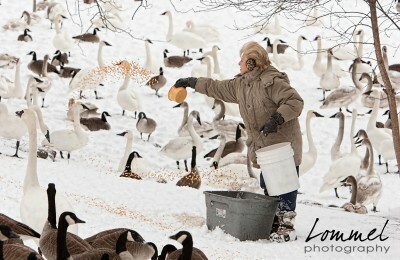 Sheila and her husband Jim have been feeding the swans for over 25 years. Because of their selfless acts of kindness to these birds, the Monticello Community has benefited more than anyone realizes. 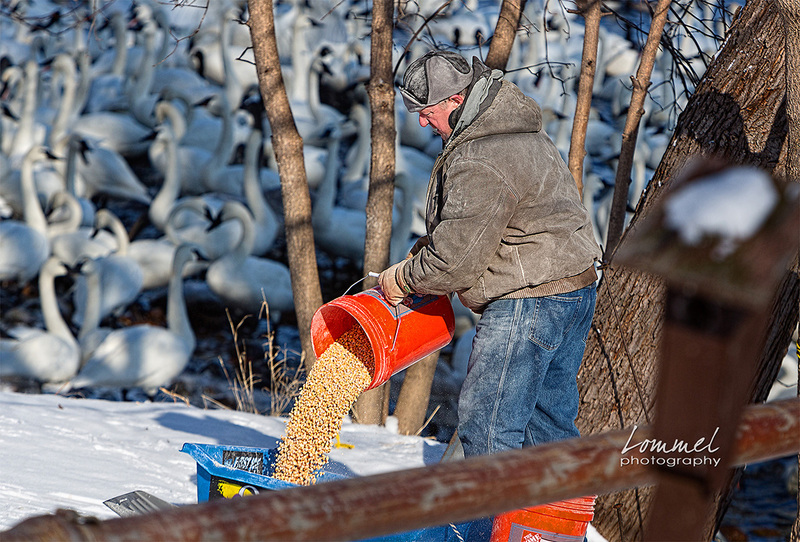 Jim Lawrence has continued to feed the Trumpeter Swans winter after winter. We need your help in continuing to fund this wonderful Monticello attraction. A special thank you Jim and Sheila Lawrence for bringing this attraction to Monticello and for all the time and money you’ve spent feeding the swans. Thank you also to the Monticello's Parks Department for your diligence and assistance in keeping up the park throughout the year. The Chamber reminds photographers and viewers that the swans are very shy. They recognize the park as a place where strangers are present, but see it as a safety zone. However, they are easily spooked when someone leaves the confines ( the deck) of the park itself to venture on neighborhood properties or down to the riverbank itself for viewing or photography which is NOT allowed. 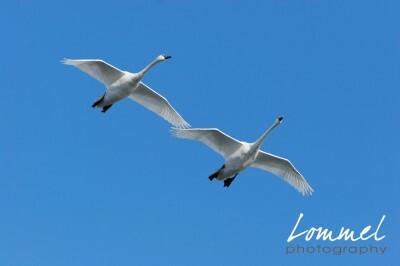 Jim Lawrence- who feeds the swans is the only 'safe' person that the swans recognize. THANK YOU for observing the privacy of these beautiful birds. We consider it an honor to have them on our riverfront and we want to respect both the volunteer efforts of the Monticello resident as well as the trumpeter swans. From St. Cloud: Take the 2nd Monticello Exit (#194) off of I-94 East, which brings you to County Road 18. Take a right onto County Road 18. From Minneapolis: Take the first Monticello Exit (#194) off I-94, which brings you to Country Road 18. Take a right onto County Road 18. Continue straight ahead, through the stop light (the road turns in County Rd 39E) you will take the second left onto the street Mississippi Drive. Follow the residential housing until you see a little sliver of a park located on the right hand side near the end of Mississippi Drive. This is where you may view the swans in a park-like setting. Swan Park is wheelchair accessible. If you have any questions call the Chamber Office 763-295-2700. REMINDER: Please do not trespass in anyone's yard. 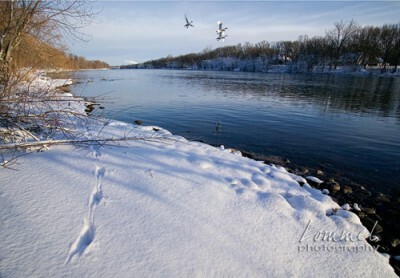 You may view the swans by walking down a small asphalt pathway and to the viewing deck overlooking the river bank. Mississippi Drive ends in a cul-de-sac, so please utilize this to turn around. You may also get back into your vehicle and head east further down the river and view from alongside County Road 39 East. Reminder: There are opportunities for photography at every glance. Please do not trespass into anyone's yard.